Timber-Pro Industries Inc. in Logan Lake, BC provides custom-made sawmill equipment and consultation/design services for small value-added wood product operators throughout British Columbia. With 45 years of experience in lumber and remanufacturing in different countries around the world, Marv Funk of Timber-Pro has the expertise to help increase productivity and efficiency of your value-added wood business. Our Timber-Pro Lumber Stacker is innovatively designed and built to allow for maximum efficiency in the workflow of your wood production from raw material to finished product. 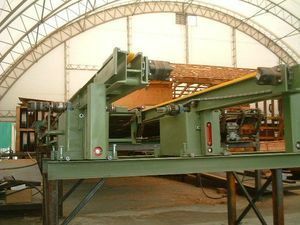 In many small value-added lumber operations, there is only one person involved in many or all phases, and these lumber stackers allow for that in a way that minimizes down-time and waste wood. Dimensions can be customized to suit the needs of your operation. For further information about our lumber stackers or our other cost-effective value-added wood production systems, please contact Timber-Pro in Logan Lake for a quote.